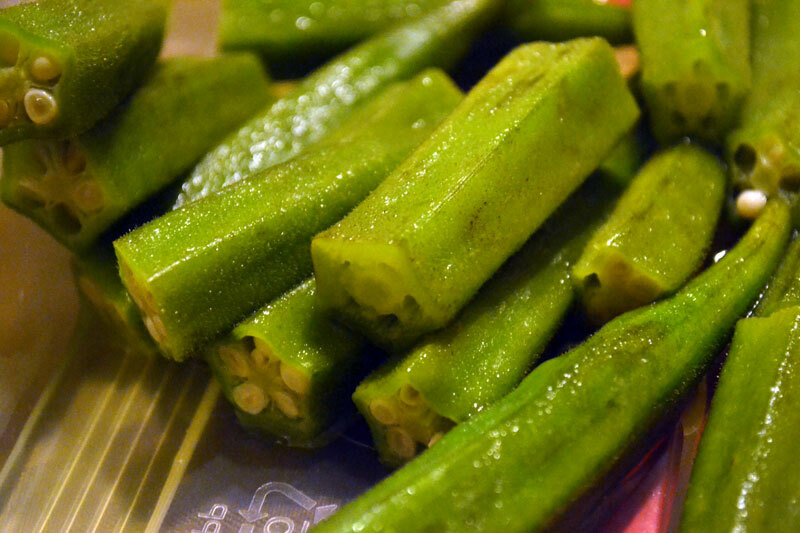 For as long as I can remember, my parents have been serving up steamed okra but I never learned to like it. Sure, I like it in dinengdeng but in it pure, steamed version I can't seem to get over how slimy it is. This was served in a friends' gathering just last week, but I just took a photo then proceeded to ignore it for the rest of the meal. Good thing there were other choices! Which is my loss, come to think of it. For okra is high in fiber, vitamin C, and folate content (according to Wikipedia). Steaming okra is easy as, especially if you are already cooking rice. When you are in the "in-in" stage where most of the water has evaporated and it's time to cover the pot and lower the heat, just place the okra on top of the rice. You can do the same with the rice cooker method, by putting the okra in when the cooker switches to "heat" mode.